Look like a confectioner making this Chocolate-Covered Coconut Candy recipe. The coconut candy has just 4 ingredients that pull off a fancy look and taste. Mix corn syrup, sugar and water in large saucepan. Bring to boil on medium heat, stirring until sugar is dissolved. Stir in coconut. Continue boiling, without stirring, until temperature on candy thermometer reaches 236°F. Drop teaspoonfuls of the coconut mixture onto large sheet of wax paper. Cool. Meanwhile, microwave chocolate in medium microwaveable bowl on HIGH 2 min. or until chocolate is almost melted, stirring after 1 min. Stir until chocolate is completely melted. Cool until temperature on candy thermometer reaches 83°F. 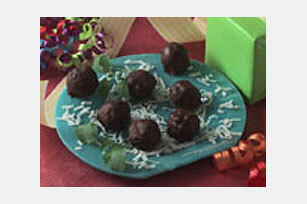 Dip coconut balls into chocolate, turning until completely covered. Return to sheet of wax paper; let stand until chocolate is firm. If you don't have a candy thermometer, remove a small amount of the hot sugar mixture and add to cold water. If the syrup forms a soft ball, then the syrup is at the right temperature.